On November 29th, the Cooper Union ASCE chapter hosted Langan for a company presentation. Many students came to hear about the projects Langan works on, and to learn about possible opportunities. Langan collected many resumes at the event. About 25 students came. On November 20th, Joe Viola came to Cooper to discuss the requirements and application process for the ACEC scholarship. Students in attendance also heard from previous scholarship winners and were encouraged to apply. About 20 students came. On November 10th, the Cooper ASCE chapter participated in an ASCE Met Section Community Service Event. Participants helped cleanup the trails of Inwood Hill Park by clearing drains to improve drainage and reduce erosion. On November 8th, representatives from ARUP came to Cooper to give a company presentation to civil, mechanical, and electrical engineering students. This event involved coordination with the ASME and IEEE Cooper chapters. Students learned about the many opportunities they may explore at ARUP. About 30 students came. 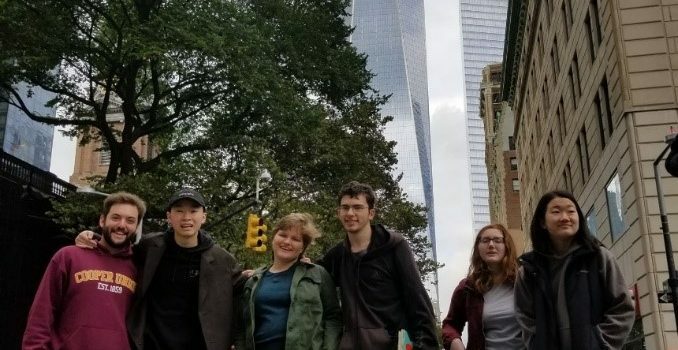 On October 20th, a Cooper Union alumnus led a tour for the ASCE chapter of downtown Manhattan. The tour included historical and engineering landmarks. It is a great event for students new to NYC, and it serves as a nice study break during midterm season. 6 students came.